The Québécois area of Charlevoix is a hidden gem, a pocket of barely touched nature embraced by mountainous terrain, rugged vegetation and the world-famous St. Lawrence River. 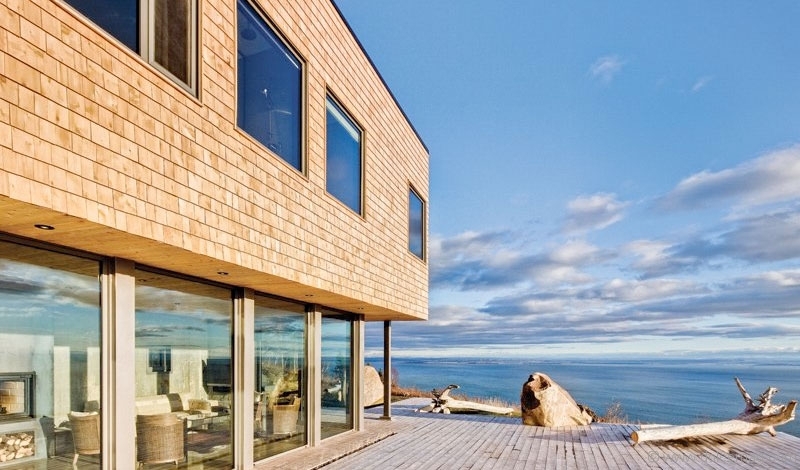 Montreal-based design firm MU Architecture landed the project of a lifetime when asked to design a series of rental homes in this rugged little piece of paradise, and thus Malbaie VI: Marée Basse, the second of many installations, was born. Built snugly into the uneven topography of the landscape, and made with such natural materials, Marée Basse appears barely there at first glance, but a closer look will reveal an architectural marvel, both inside and out. 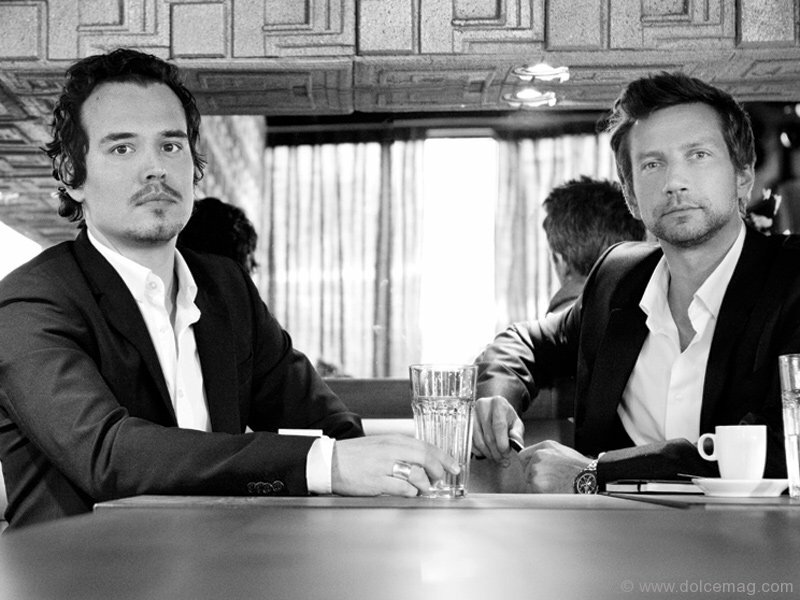 Jean-Sébastien Herr and Charles Côté, architects, co-presidents and co-founders at MU Architecture, reveal to Dolce Magazine the mystery and artistry of this dynamic project. Q: How did this project come about for MU Architecture? A: Marée Basse is part of a residential development. It’s privately owned. The developer actually bought a piece of land that he subdivided into 103 lots, and he asked us to develop this series of houses for rental purposes. We started off with Malbaie V: Le Phare, and then developed Malbaie VI: Marée Basse. 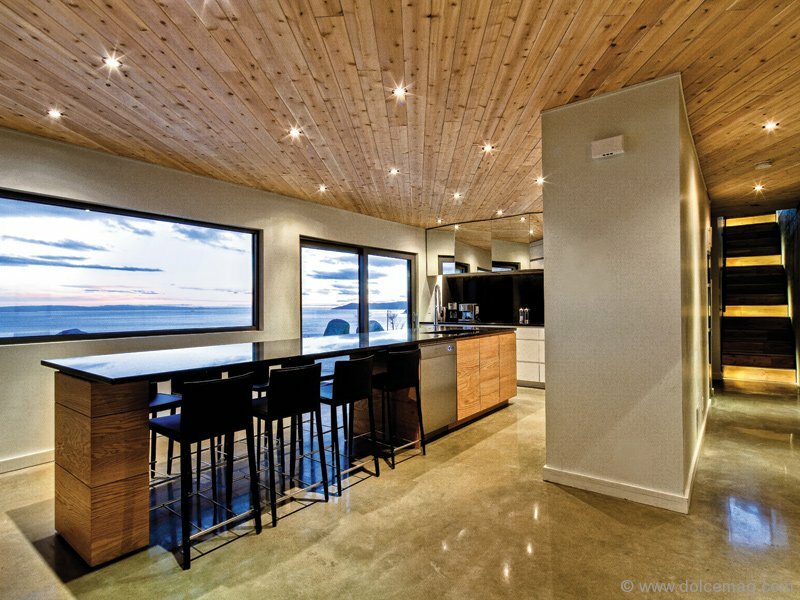 Malbaie VI: Marée Basse is the second house we developed for the owner. So there is a client, of course, but there is not a specific end user because the houses are all developed for rental purposes. Q: You as a team must have had quite a bit of freedom designing, then? A: Totally. But at the same time we were asked to develop a design guideline for the whole development so other architects can come and work on the development. So the first houses had to set the tone for the development, which is why we chose specific materials, all locally found. We wanted the shapes of the houses to be as simple as possible, as minimalistic as possible, in order to maximize views toward the river, toward the mountains, and benefit as much as possible from the natural light. So Marée Basse was developed according to the topography of the site, and the orientations toward the marina, the mountains and the river. That’s why it has a specific V-shaped angle, in order to target the marina, which is just a little bit lower on the site. And we wanted to create that private terrace at the bottom level that would be hidden from neighbours’ view. Q: Was privacy an important element while designing? A: Definitely, because considering it’s a development, you’re going to have neighbours on your left, on your right, at the back, so we wanted to provide as much intimacy and privacy as possible. Q: What are your thoughts on the location, Charlevoix? A: To me, Charlevoix is probably the most beautiful area in Quebec because of its variety of topography, of landscape, of species, whether it’s animals or trees. It’s very rich, it’s a very wide and open space. The lots of this development are very big, so it feels like you’re in the middle of nowhere. You literally don’t see your neighbours. This point of the river is 16 kilometres wide, so the view of it here feels like it’s almost like an ocean. People get easily confused by the impressive look of the river and the impact it has on the land. It’s gorgeous. Q: What materials were used to construct Marée Basse? 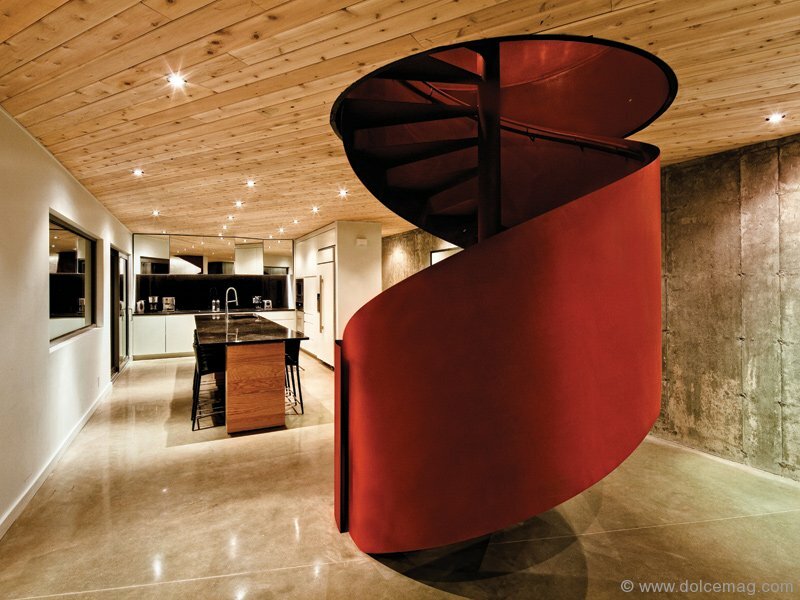 A: We wanted the project to be as integrated as possible within the nature. 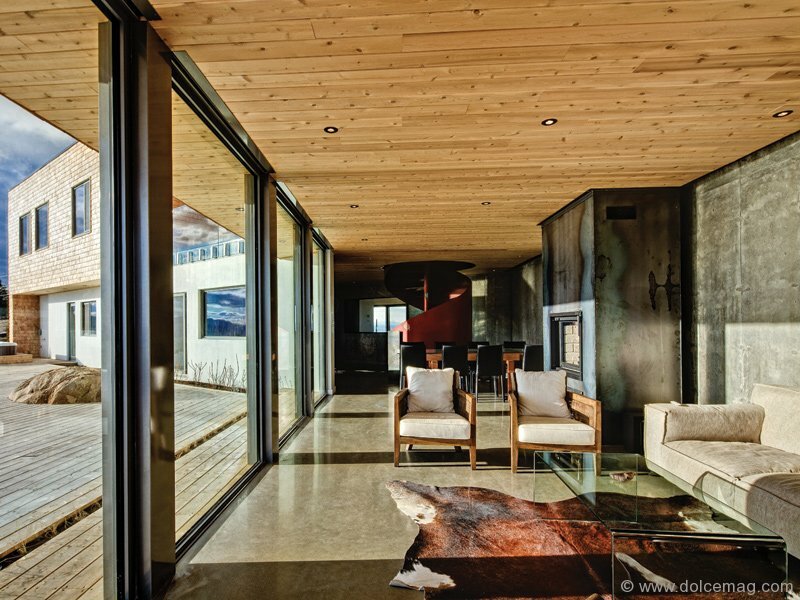 The choice of materials, like the cedar, was very specific, because we like materials that age and change colour and blend with the nature. We wanted natural products as well, natural materials that can be found locally. We didn’t want to create architecture that was going to add too much of a sculptural aspect to the landscape, we wanted something very subtle that would blend in. Q: How many more instalments have you completed for this development? A: So far we have four built, and we have two more on the boards, and we probably made a total of about eight designs. Q: What does this project mean to you personally? Does it have any particular sentiment to you as a designer? A: Well, of course, we are very attached to all our designs. But over the years we have seen that Marée Basse and Le Phare generate a lot of interest, because they’re so minimalistic, so simple, in their shapes and exterior volumes, that people can relate to them very easily. But after these first two designs we moved on to a different sort of style when designing the subsequent houses for the development. Q: What type of style did you evolve to? A: If you look at our latest house for this development, La Grange, you’ll find that we’re looking into more dynamic shapes. We now play with angles with folded panels. We are still integrating the volumes with the landscape, with the topography, but we try to generate dynamism with the volumes that we play with. We accentuate the views by creating angled walls or roofs. We try to make the users’ experience a bit more interesting, not with just plain materials or plain surfaces, but we try to integrate the interior design or the external shape of the house as an experience on its own. We tried to bring the users to another type of experience, whether it’s just walking through a glass corridor and seeing the natural light coming in, or playing with materials. Q: Have you received any feedback from anyone who’s rented the property? A: It’s a huge success. These houses have been rented throughout the year with 85 per cent occupancy. The owners are very excited. 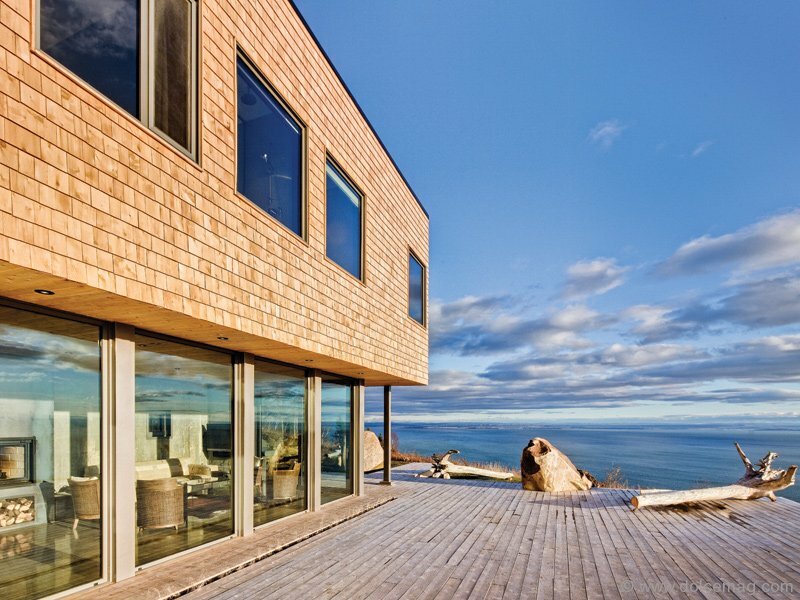 Marée Basse and Le Phare in particular made it in Taschen’s Wood Architecture Now! Vol. 2. So we’re very excited about this project.